So you’ve been embracing your entrepreneurial side, you’ve just quit your day job and started playing around with a few business ideas. After some research you’ve decided that you want to create a subscription box business and you have what it takes to become the next Barkbox or BirchBox. The next question you ask yourself is where do you start next? Well first of all you need to build a subscription box website and you’re in luck we’ve just made starting your own subscription box service, easy. Really easy. Subbly is a website builder and eCommerce platform that allows you to launch your own subscription eCommerce store. You can launch a subscription box store in just minutes and we’ll take care of hosting, payments collection and automated customer e-mails. In a nutshell, just take a few minutes to set up your shop and we’ll handle the rest. All you have to do is send out your subscription boxes to your excited new customers! Complex – You’ll need technical knowledge to build and develop your own subscription box website and even if you have the required skills. Integrating with 3rd party platforms, plugins and APi”s to handle recurring payments and automated email notifications etc can be overwhelming. Confused? Case in point! Time Consuming – Researching all the available complex options is not the only thing that is going to put a strain on your valuable time. An alternative to building the site yourself would be to perhaps research existing plugins and ways you could mayou could yo find someone to build this for you. A sensible option would be to find a developer. But good developers are very hard to come by and you can spend hours trying to find the right person to do the job. Expensive – Unfortunately, even when you do find an awesome developer 99% of the time you have to pay them. Not always easy and cost effective as a bootstrapping new business. The other option is using a web design agency to build your site. But, you’ll always be at the mercy of super high hourly rates and even once your site is built, any changes you need to make or features you need to add will cost you… and usually cost you a good whack! 3. How Does Subbly Work? Design Your Shop with Our Website Builder – You can choose from one of our subscription website templates and themes (More coming soon!) to customize your shop. You can have your shop designed to match your brand within minutes too, simply upload your logo and color scheme. You can even add a background image if you require. We’ve made it as easy as possible for you to get your branded shop online without any hassle or technical knowledge required. 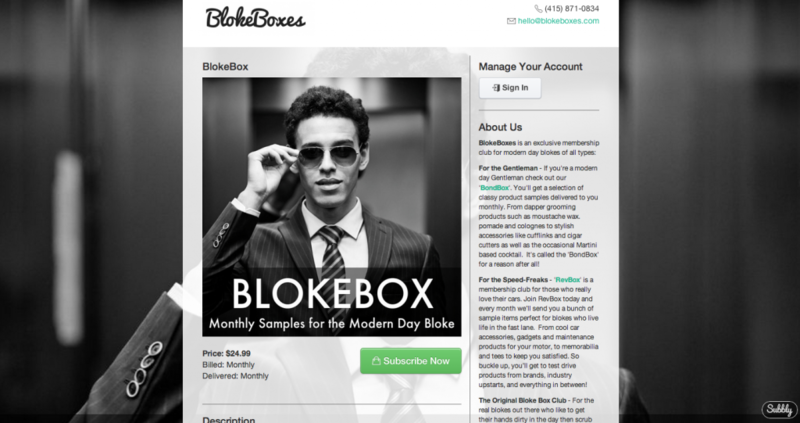 Add Your Product – Once you’ve designed your shop you are able to add your subscription box product. Just upload an image, set a price enter a product description and your box will be added to your shop. It’s seriously that easy! You can even add YouTube videos to your shop Check examples of Subscription Box companies who have used Subbly. Manage Your Payments – Subbly uses Stripe to automatically handle and manage all your payments. All you need to do now is connect your Subbly shop with Stripe. If you haven’t got a Stripe account you can set it up in minutes. Get Automated Notifications – It’s important to find out when you have new boxes to ship or when you get a new customer. We’ve got it covered. You will receive instant email notifications on every event that happens on your shop. We also keep your customers in the loop as well. Get Paid Quickly – Because we use Stripe to handle our payments this means you get paid 7 days after the transaction is completed. That’s one less worry for you when it comes to managing your cashflow. Manage Orders with Ease – With the Subbly Dashboard you can quickly see who has ordered what and when in one simple view. you can also print off your delivery slips and mark who has been sent their delivery/box. Subbly Accepts Major Credit & Debit Cards – Our Stripe integration powers our payments. That means you can accept all types of Credit and Debit Cards without hassle or need for a merchant account. Custom Domains – Got your own cool name for your business? Awesome! Subbly can show you exactly how to add your custom domain for your shop. It’s super simple! Mobile Responsive – Our application is completely mobile friendly. This means your customers can subscribe on the go and you can still handle their order on the go! Analytics – Knowledge is power and thats why Subbly offers analytics that track the number of visits to your shop as well as how many customers you have in and more in one easy dashboard view. 100% Secure – In the modern age security is vital. Our integration with Stripe means that we have secure servers and SSL encryption you can be confident you and your customers are safe. Excellent Support – We’re here for you 24/7. Ask us questions, request new features and even just say hello. We’re on hand to help you run a successful Subscription eCommerce Business. 4. How Much Does Subbly Cost? Heres the good news, it’s not going to cost you the thousands of dollars it would cost you to get someone else to build your subscription eCommerce site! Subbly offers a monthly fee of just $59 a month and a small transaction fee per each one of your subscribers. Even more good news: sign up today and we’ll give you a discount rate of just $19 for the first year. This offer ends on August 21st 2014 so don’t miss out! 5. What Other Platforms Are out There That Offer the Same Service? Currently there are a few other platforms that with a little bit of hacking allow you to manage your subscription box payments. Shopify Plugins – Currently a combination of linking an existing eCommerce site built on Shopify and integrating plugins such as Recurly and Chargify. Complicated with technical knowledge required, problems such as duplicate accounts for your customers mean this can be a time consuming and complex way around managing your subscriptions. You are limited to customisation and you have to have a Shopify site too. If you have the technical resources or know how, this is the quick hack to set up your subscription eCommerce website. WordPress Plugins – Similar to how the plugins for Shopify work, comprehensive research into which plugins will suit your requirements is needed. The integration into your wordpress site without any technical knowledge can be a hassle and end up costing you more money. Customisation is limited again and having your subscriptions and payments managed by up to 3 or 4 different parties can be stressful to say the least. Again though, if you have the technical knowledge or experience, this is the quickest way to integrate with your current wordpress site. Cratejoy – Currently in Beta Cratejoy is an ‘off the shelf’’ solution for setting up a subscription box service. Similar to Subbly they offer some comprehensive features and analytics as well as some cool template designs. Their pricing model is $1 per subscriber with discounts based on how many subscribers you have. This pricing model can prove valuable for smaller subscription box businesses but less so for those who prefer fixed monthly prices for easier cashflow planning and want more control over managing their margins etc. With Subbly, everything is handled on our platform. Manage your payments, notifications, emails, shop and more on the Subbly Dashboard. No complicated work arounds and hacks, no technical knowledge required and no hidden transactional fees and high costs. Simple price structure. Simple setup. Simples!